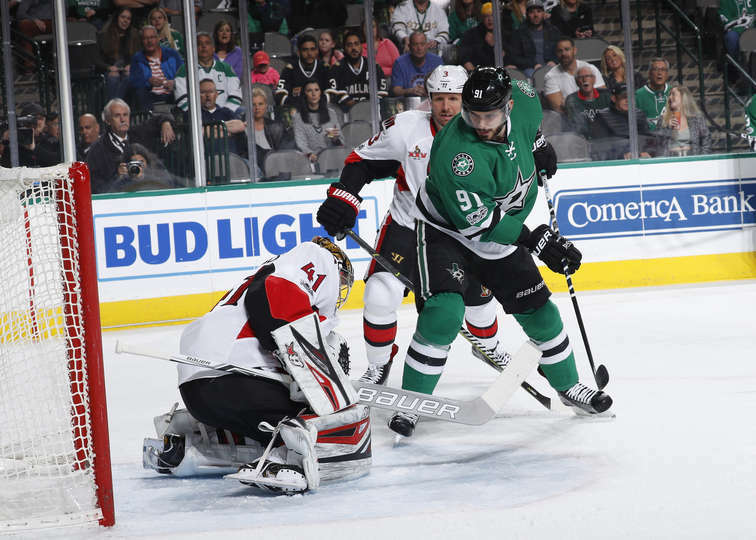 DALLAS — Craig Anderson made 35 saves for the Ottawa Senators in a 5-2 win against the Dallas Stars at American Airlines Center on Wednesday. It was Anderson’s 146th victory with Ottawa, tying Patrick Lalime for the most in Senators history. “It’s a credit to the guys in front for all these years of hard work and dedication, and just a byproduct of guys playing hard in front of me,” Anderson said. Cody Ceci, Viktor Stalberg and Fredrik Claesson each had a goal and an assist, and the Senators (37-22-6) won their fourth straight. The Stars (27-30-10) lost for the first time in three games. Chris Wideman gave Ottawa a 1-0 lead at 13:41 of the first period on the power play. Stalberg set up the goal with a cross-ice pass. The Senators made it 2-0 at 15:21 when Claesson scored after a clean faceoff win by Zack Smith against Radek Faksa. Jean-Gabriel Pageau gave Ottawa a 3-0 lead at 3:21 of the second period. The shot from the slot beat Kari Lehtonen through the five-hole, and the Stars goalie was replaced by Antti Niemi after allowing three goals on 18 shots. Tyler Seguin made it 3-1 at 4:30 when he scored on a sharp-angled shot after a pass from Jason Spezza behind the net. Remi Elie had the secondary assist for his first NHL point in his third game. Stalberg put Ottawa ahead 4-1 at 18:09 when he scored on the power play. Spezza scored on the power play at 8:04 of the third period to make it 4-2. Ceci made it 5-2 when his point shot deflected in off Stars defenseman Stephen Johns at 9:01. Anderson is 146-96-31 in seven seasons with Ottawa. Lalime was 146-100-30 (ties) from 1999-04. Claesson beat Lehtonen with a one-timer from above the left circle for his first NHL goal. “It feels really good. I kind of waited for this moment for a long time. I’m really happy. It was a faceoff and I wasn’t sure if [Mike Hoffman] was going to take it or not, so I just hammered and an old knuckle puck there,” Claesson said. Anderson made a left-pad save on Brett Ritchie’s shot from the slot with 6:00 remaining after Curtis McKenzie backhanded a pass from below the goal line. After getting 19 seconds of power-play time in his first three games since coming to the Senators in a trade from the Carolina Hurricanes on Feb. 28, Stalberg took advantage of the 2:27 he got Wednesday, deflecting Dion Phaneuf’s point shot past Niemi for his second goal with Ottawa. Stalberg drove around Stars defenseman Jamie Oleksiak and drew a holding penalty that led to Wideman’s power-play goal. The Senators dressed 11 forwards and seven defensemen. … Ottawa coach Guy Boucher said he had not decided whether Anderson or Mike Condon would start Thursday against the Arizona Coyotes.